Legalized marijuana in Colorado is inspiring brides to rethink celebrations. camera (Nerida McMurray Photography/ Getty Images ) In states where marijuana has been legalized, some couples are looking to incorporate cannabis into their nuptials. Since the legalization of marijuana in Colorado at the beginning of 2014, residents and entrepreneurs throughout the state have been exploring new ways to incorporate cannabis into their lives. So it was really only a matter of time before brides and grooms began considering how to include it in their wedding celebrations. From vaping stations at cocktail hours to pot-leaf bouquets for the bridal party, marijuana marries itself to the event in countless ways. 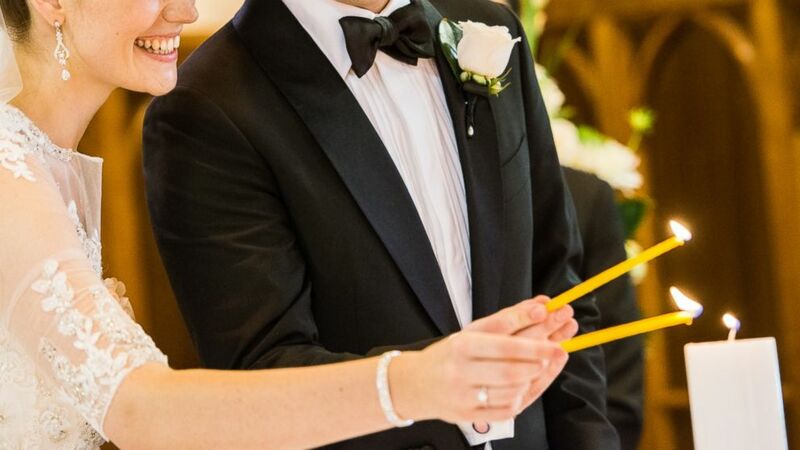 "The sentiment is that 'it's new,'" said Anja Winnika, site director at online wedding resource The Knot.com, which first noticed the topic being discussed on chat boards. "With it being legal in Colorado, it's not surprising to hear that some couples are planning to incorporate it into their day." After launching a poll last week asking members of The Knot how they felt about the inclusion of cannabis at a wedding, nearly 1,000 respondents have chimed in. So far, 67 percent have voted "Yeah! I'd love to go to that wedding," 22 percent voted "No! Drugs don't belong at weddings," and the remaining 11 percent kept things neutral, stating "I'm not for or against it." Proponents of the idea say that, in places where weed is legal, it's no different than offering alcohol during the cocktail hour. "Toasts and open bars are standard at weddings," said Jane West, founder of Edible Events, a party-planning agency that focuses on private and glamorous cannabis events. "There is usually somewhere at a wedding venue to also have a cigarette. Now we can also consume cannabis as long as the event is private." Having already received a number of inquiries from brides both local and out of state, West is quickly crafting ideas for cannabis inclusion at weddings and pre-parties. "I am booking one shower and one wedding right now," said West. "For the bridal shower, we can start the day with a group breakfast that includes a THC-infused granola bar from a local company called Julie & Kate's, then the women will all go for a hike and finish with massages at a spa. "For the wedding, we are having all of the men wear 'bud-tonnieres' where their boutonniere is made with a small cannabis bud of the wedding party member's choice -- sativa or indica," she continued. "After the formalities of the ceremony, they can remove the item, put it in the wedding party gift, which is a pipe, and smoke it." While none of the brides ABC News reached out to immediately responded, bride to-be Christianna Lewis told The Knot that she and her groom have chosen to "throw a co-ed bridal shower with a variety of weed sweets and edibles involved." From THC-infused foods and elixirs to personal vaping pens to traditional pipes, West said there are numerous modes that lend themselves to social environments. She expects Colorado destination weddings to spike in popularity soon. "We have great weather and the mountains as a backdrop," she said. "So adding the option of having legal cannabis involved without reprimands or fines I think will really attract a large segment of people." As cannabis-infused nuptials is still a relatively new phenomenon, however, it may take some reception venues time to get up to speed. "I sensed that venue owners in Colorado and Washington will be the ones shaping the trend," Winnika said. For example, Roxie Ellis, owner of Ellis Ranch and Event Center in Loveland, Colo., recently turned down a wedding that wanted to host a hemp bar in place of alcohol because she was unsure whether it would be a liability. Other properties are simply being more discreet. While she would not disclose the names of the venues that she is currently working with to host such affairs, West did acknowledged that "we do have some private settings that are supportive of our efforts."